4x4 tracks 250-500 km from Perth. 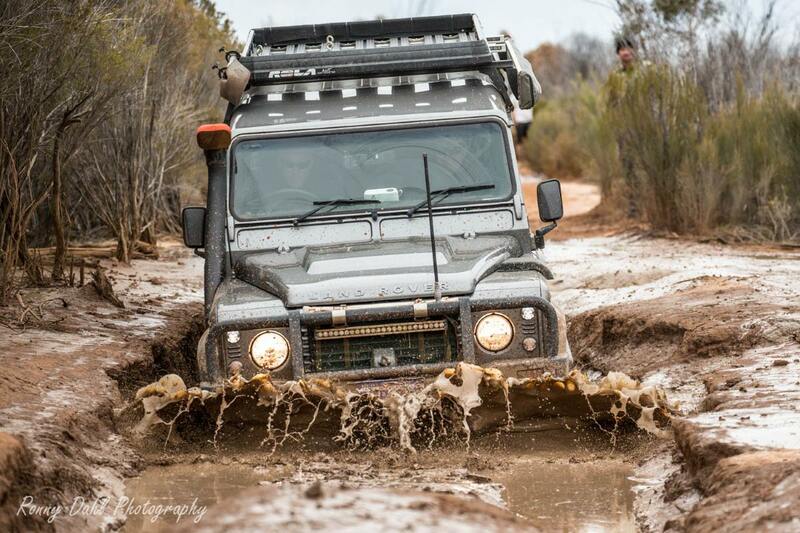 On this page we cover 4x4 tracks within a 250-500 km radius from Perth. To get more information about a particular track or place, just click on the link and it will take you to a page with all the information you will need about the track, the conditions and what you will need to bring along. When you get to a distance of about 250-500 km from Perth you are actually getting into what we in Western Australia call the Outback especially if you travel inland, so take care and travel safely. One Of The Entry Tracks To D'Entrecasteaux National Park. 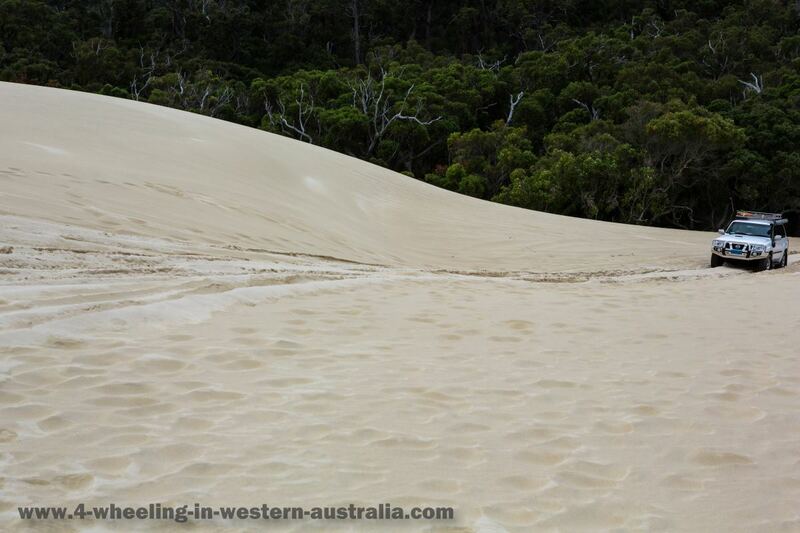 D'Entrecasteaux National Park has lots to offer for any 4 wheel driver! 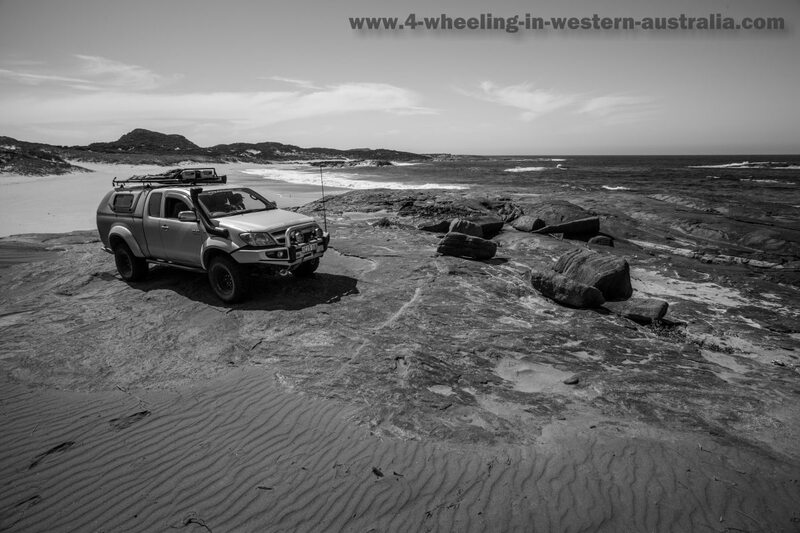 East of Windy Harbor and South East of Northcliffe you will find many great 4x4 tracks, remote beaches, camp grounds, fishing shacks and plenty of wild life! 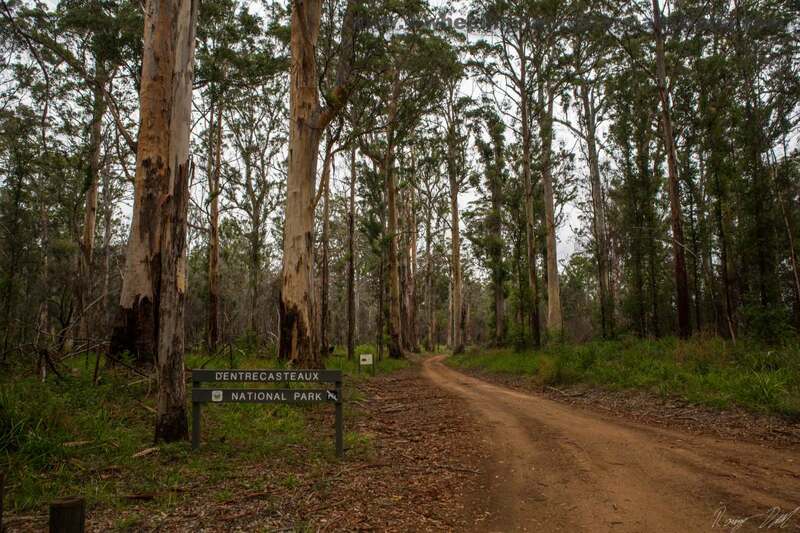 For More Information See: D'Entrecasteaux National Park. Muddy section of road at Ninghan station. Distance from Perth: 381 km north east of Perth, along the Great Northern Highway. Time to allow: can be done as an overnighter but 2+ days would be best as there is about a week’s worth if not more of exploring to do. Jagged sharp rocks are the main part of many tracks, other tracks are clay and hard packed sand. The climb to Mount Singleton is on harsh jagged rocks and steep in some points (medium to hard), apart from that the rest of Ninghan is easy to navigate. For more information go to Ninghan Station. The Entry Sand Dune to Yeagarup Dunes. Distance from Perth: 330 km. 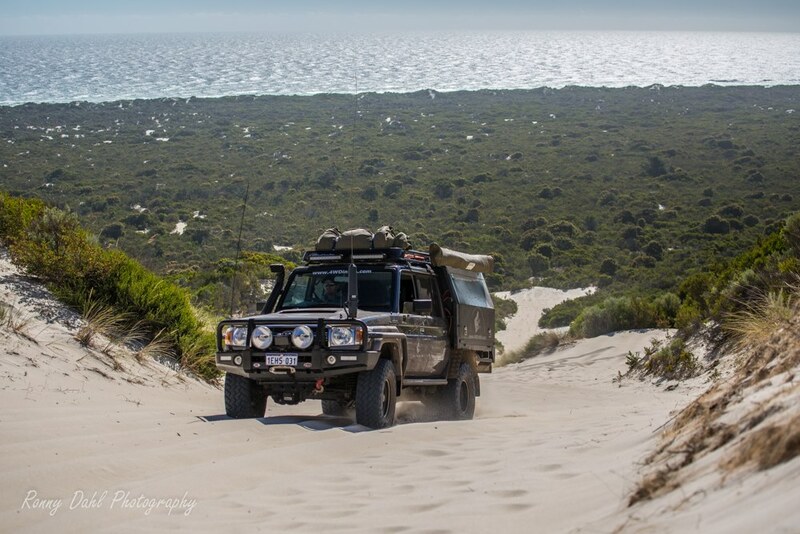 Yeagarup Beach and Sand dunes is about 24 km fro Pemberton, south of Perth, and is ideal for a weekend or long weekend away if you want to give your 4x4 a run in the sand and maybe do a river crossing at the Warren River. The sand dunes here cover almost 30 square kilometres. For more information see Yeagarup Dunes and Beach. The 79 series Land Cruiser on Callcup Hill. Callcup Hill is the most challenging dune with no real chicken track we have come across so far! Hit the entrance of Yeagarup dunes in the most spectacular way, straight from the lush green Karri forest and onto the white sands of Yeagarup dunes. For more information see Callcup Hill. Pemberton & Warren National Park. Moons Crossing. One of many river crossings in Warren State Forest. Most forest tracks (this includes national parks) are well maintained and you can tell as soon as you drive on them .The tracks that peel off can be overgrown, rutted, very muddy in winter & some submerged in deep water, it all really depends on the weather. The town mainly thrives on tourists, there is plenty of accommodation in and around the outskirts of town. As in a lot of the South West of WA there are many wineries and a few micro breweries around that are well worth a visit, along with great restaurants (quite a few at the wineries). Distance from Perth: Perth to Stockyard Gully Caves 280km, Perth to Lake Indoon via Stockyard Gully 305km, Perth to Lesueur National Park 240km. Most of this trip is on well maintained gravel roads, the track to Stockyard Gully is 4x4 only and 20-25 PSI is recommended to avoid chewing up the track. The one way road to Lesueur National Park is black top. On this trip there are 3 places to visit, The Stockyard Gully Caves, Lesueur National Park & Lake Indoon. This part of W.A. could be combined with a trip to Wedge Island, Cervantes, Jurien Bay or even Lancelin. The Defender On The Holland Track. Distance from Perth to Hyden 360km. The Holland Track from Hyden to Coolgardie is about 260 km. 50 km east from Hyden is where the actual 4wd section starts from (Note* Broome hill to Hyden is the southern half of the Holland track which is all two wheel drive and can be done in one day). If the Holland Track is on your bucket list you can find more information here. Peaceful Bay and Denmark area. Visit the great area around Denmark and Peaceful Bay in the Southern part of Western Australia. Here you will find nice beaches and great 4 wheel tracks, so why not combine your 4 wheel driving with a holiday in the great South Western part of our state. For more information see: Peaceful Bay and Denmark Area. For information about GPS Waypoints see: Peaceful Bay area GPS Waypoints. Leave 4x4 And Go To Home Page.